This summer, we plan to provide a ‘Slum for Nature’ program for the niños surviving in the megaslum Ciudad Bolívar, Colombia. 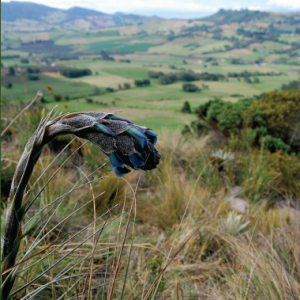 Our 4-6 week plan is to integrate them with the beautiful Colombian countryside of the lower Andes Mountains, and provide supplementary education in Science, Mathematics, and English. Understanding that bilingual capacity can increase employment outcomes in Colombia, this model can lead to longterm, sustainable poverty remediation of those surviving in the slums. 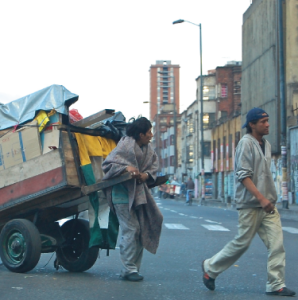 In this picture captured by our founder, two recicladores are seen traversing a busy street in Bogotá to load and carry away rubbish. Everyday about 18,000 recicladores scurry for trash, laboriously transporting society’s burden with them. This is the real face of poverty here. Please join and share the Thread of Hope, where your generous donation of a new change of clothes for a child can relieve so much, where there is so little. Along the corridors of makeshift shelters and tents lie the faces of diaspora. 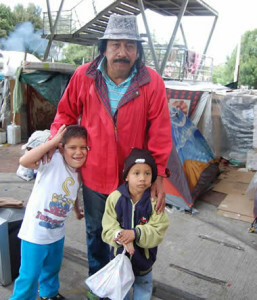 In December 2013, our founder was able to interview their leader who is seeking refuge in a tent community under a bridge in Bogotá, Colombia. Tomorrow we will be providing water and other survival essentials. In the near future we will have their story via Google Glass compiled and ready to share. Special thanks to Mateo for his invaluable assistance today. A compounding factor affecting Colombian children are the landmines that claim nearly as many casualties as Afghanistan, placing Colombia second in the world in landmine victims. Because of the ongoing struggle for power, FARC guerrillas are notorious in placing landmines close to strongholds, strategic positions, even including schools. Though they (FARC) are not the only players in this conflict, the leftist party is also involved and their aim is to undermine the current regime through a 50 year campaign of terror and violence. A snapshot of Ciudad Bolívar, a sanctuary for the largest internally displaced population in the world. This megaslum is outside the expansive metropolis and the relative safety of Bogotá, Colombia. This is where we inspire love. This is where we share hope. We are now accepting sponsors for backpacks and school supplies such as Play-Doh, pencils, and colors for the children in the slums! If you would like to be assigned a child, please send us an email and phone number, and we will provide you information and picture of a child. If you share the same vision as Thread of Hope please share and tell your friends! 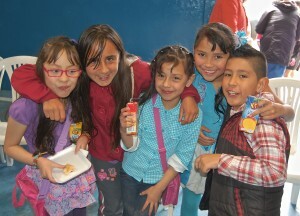 If you would like information on how you can impact a life by sponsoring a child, please complete this form. With financial contributions directed to sponsored children, we are able to provide tuition assistance and ensure adequate nutrition are being provided. If you would like to send us a letter or a care package (clothes, school supplies) for your sponsored child, you can now send it our way for global distribution.